I think with this listing, everyone will be posting like crazy to try and be the 500,000th. My guess is 12:43pm tomorrow. I say 5:32 PM. Grats on the milestone!! 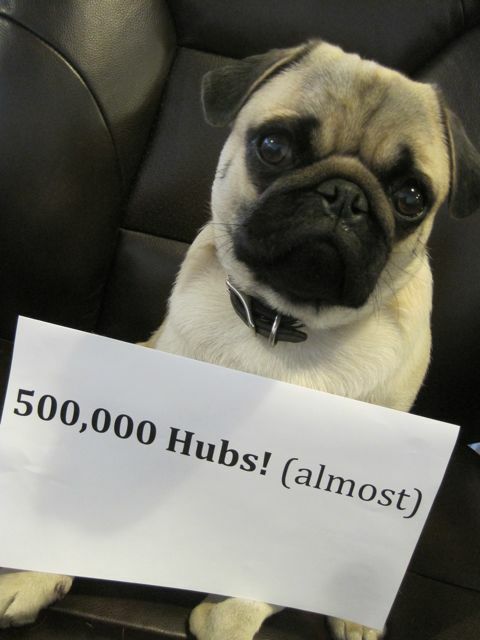 a half a million hubs?! I say, 1:12am Sept. 23 ’09 Congratulations! Hey, I’d say 6:00 pm Sept. 22, Hubpages will reach the 500,000th mark =). Please post who, if you’re able to get that. It’d be interesting to see. As of right now, it’s 499,131. I think it’ll be sooner than you think. I’d guess by 10:30ish today. My guess is September 23 at 7:32 p.m that Hubpages will reach the 500,000 mark! 9/23 at 9:23 pm CST. 9/23 at 9:23 pm CST, better make that AM with Whitney’s last update! I will guess its at 7:21pm Eastern tomorrow. Exciting news. Almost as exciting as Frank….! So the 500,000 barrier is going to crash finally.Hats off to all of us.For me it’s an important moment of celebration.When the magical figure is left behind is not so important as to who shall be that hubber(I can already envision Hubber Shinu John2008)burning rhe midnight oil and working overtime with his Aunty blogs to win the crown)..
Let’s give Hubs a standing ovation for being on the brink of the half million mark.Wonder when Adsense will start making the backdated payments to us pen-pushers(or shud we be called mouse pushers instead?